Visit & be inspired. 2018 has been designated The Year of the Churches; we have opened over 100 of the best across Northamptonshire and they all look forward to welcoming you. Weekends in Northamptonshire keep the kids & the grandparents happy. From the UK's oldest theme park to Europe's biggest urban sports venue Adrenaline Alley, & Europe's longest zip wires! From estates to manor gardens, Northamptonshire offers breathtaking private gardens large & small, with typically English backdrops. Fabulous views & tea rooms too. The country's best historic houses include Althorp, Burghley, Rockingham Castle, Canons Ashby, Holdenby House, Boughton House, 78 Derngate, Kirby Hall, Lamport Hall, Sulgrave Manor & more. Once a regular meeting place for Parliament the county has since witnessed the birth of Richard III, death of Mary Queen of Scots, Battle of Naseby & hatching of the Gunpowder Plot. Visit the world's biggest collection of shoes & the only surviving house in England designed by Charles Rennie Mackintosh, both within stepping distance of each other in Northampton. 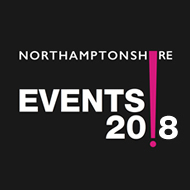 At international festivals & throughout the year live music of all genres can be enjoyed in the most stunning & unusual of Northamptonshire places; chapels, waterside wharfs & more. Northamptonshire's historic parklands offer variety to visitors throughout the year. Highlights include Brixworth Country Park, Brampton Valley Way, Fermynwoods & Irchester Country Parks. Local industry with a global footprint; this is the men's shoe-making capital of the world. Made to measure for James Bond & Prince Charles footwear remains a thriving local industry today. World-leading Men's Footwear, Britain's Best High Street & Rushden Lakes. Northamptonshire is gaining a reputation for being 'best in class' for shopping with character. Grand Prix hosts Silverstone put Northamptonshire on the motorsport map. Experience world-class motorsport at Silverstone & Santa Pod, Northampton Saints rugby at Franklins Gardens & more. With award-winning regional theatre at its heart in Northampton's Derngate, the county's heady mix of homegrown talent, world-class venues & year-round calendar of events won't disappoint. Clusters of villages & market towns set the scene for your surprising stay in Northamptonshire. Try Ashby St Ledger, home of the Gunpowder Plot; or Fotheringhay, birthplace of Richard III. Connect with wildlife & water in spectacular landscapes. Northamptonshire's impressive Nene Valley is an oasis of tranquillity with exciting opportunities for new outdoor experiences.